Missy Elliott is set to become the first woman in hip-hop to be inducted into the Songwriters Hall of Fame. She joins Dallas Austin, Tom T. Hall, John Prine, Jack Tempchin, and Yusuf Islam/Cat Stevens in the Class of 2019. "The first thing you need to know is it’s about the song, the second thing you need to know is it’s about the song, the third thing you need to know is it’s about the song," Nile Rodgers, who became Chairman of the Hall last year, said in a statement, speaking broadly about this year's selections. "The 2019 slate of inductees represents diversity and unity across genres and gender, highlighting our dedicated mission to honor music creators who have enriched our lives. These are writers who in their time literally transformed music and helped make what’s happening today possible." 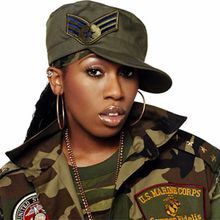 In addition to writing a slew of platinum albums, winning a bunch of Grammys, and absolutely deserving a goddamn statue, Missy has written for a host of other artists over the past two decades, including Beyoncé, Aaliyah, Whitney Houston, and Ciara. This summer, she'll become the second rapper in the Hall of Fame, joining Jay-Z, who was inducted in 2017. The 2019 Songwriters Hall of Fame induction ceremony will take place in New York City on June 13.